INDIANAPOLIS (Friday, May 13, 2016) – Simon Pagenaud’s bright new car paint scheme didn’t slow his torrid run to start the 2016 Verizon IndyCar Series season. Driving the fluorescent yellow No. 22 Menards Team Penske Chevrolet for the first time this season, Pagenaud won the Verizon P1 Award for pole position in qualifying for the Angie’s List Grand Prix of Indianapolis. Winner of the most recent two races this season, the Verizon IndyCar Series championship leader notched his second straight pole of 2016 and fourth of his career with a lap of 1 minute, 8.6868 seconds (127.832 mph) in the Firestone Fast Six – the last of three rounds of knockout qualifying. He will lead the 25-car field to the green flag in Saturday’s 82-lap race on the 2.439-mile Indianapolis Motor Speedway road course (3:30 p.m. ET, ABC and Advance Auto Parts INDYCAR Radio Network). “It’s the most fun I’ve ever had in racing,” said Pagenaud, who hasn’t finished lower than second in the first four races this season. The 31-year-old Frenchman is in his second year with Team Penske and seventh overall racing Indy cars. Charlie Kimball, driver of the Chip Ganassi Racing No. 83 Tresiba Chevrolet, will start next to Pagenaud on Row 1 following a career-best qualifying effort. Kimball’s lap in the Firestone Fast Six was 1:08.9816 (127.286 mph). “We made the race car better and better and we didn’t focus too much on qualifying, so I think we have a good pace for tomorrow,” Kimball said. “Having finished fifth here the last two years, I’m looking forward to the race. It’s neat to be on the front row. Pagenaud won races last month on the streets of Long Beach, Calif., and the Barber Motorsports Park road course in Birmingham, Ala., leading up to this epic month of May at Indianapolis that includes the 100th Running of the Indianapolis 500 presented by PennGrade Motor Oil on May 29. He is the only driver to qualify for the Firestone Fast Six in all four road/street-course events this season. Will Power, Pagenaud’s teammate at Team Penske, set the track record in Segment 1 of qualifying with a lap of 1:08.6746. It broke Power’s own record set last year by more than eight-tenths of a second, but the driver of the No. 12 Verizon Team Penske failed to advance from Segment 2 to the Firestone Fast Six and will start the race in the 12th spot. Two cars that had reached the Firestone Fast Six were penalized during the post-qualifying technical inspection for failing to meet the minimum car weight. The No. 15 of Graham Rahal, which had qualified third, and the No. 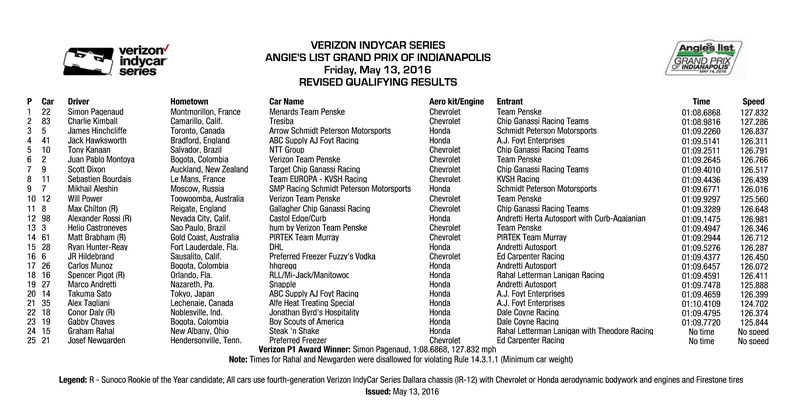 21 of Josef Newgarden, which qualified fifth, had their times voided according to Rule 14.3.1.1 of the Verizon IndyCar Series Rule Book and will start from the rear of the field. With the changes, Row 2 consists of James Hinchcliffe in the No. 5 Arrow Schmidt Peterson Motorsports Honda (a season-best start with a time of 1:09.2260, 126.837 mph) and Jack Hawksworth in the No. 41 ABC Supply AJ Foyt Racing Honda (also a season-best start with a time of 1:09.5141, 126.311 mph). Tony Kanaan, in the No. 10 NTT Group Chevrolet, and Juan Pablo Montoya, in the No. 2 Verizon Team Penske Chevy, will be in Row 3. Scott Dixon, who trails Pagenaud by 48 points for the championship lead, will start ninth in the No. 9 Target Chip Ganassi Racing Chevrolet. INDIANAPOLIS (Friday, May 13, 2016) – INDYCAR announced today that the Verizon IndyCar Series will return to Watkins Glen International for an event on Sept. 1-4. Tickets for the Labor Day weekend event – which will also feature Indy Lights – will go on sale next week and will be available for purchase at TheGlen.com and by calling (866) 461-RACE. The race will be the 15th event on the 16-race schedule and will likely play an integral role in the chase for the 2016 Verizon IndyCar Series championship. Watkins Glen joins Phoenix International Raceway and Road America in a 2016 schedule that returns INDYCAR to fan-favorite venues with deep history in the sport. The 60-lap event will be held on the track’s 3.4-mile permanent road course and broadcast live on NBCSN and the Advance Auto Parts INDYCAR Radio Network, XM 209 and Sirius 212. Watkins Glen International has hosted nine past Indy car races, from 1979-81 and again from 2005-10. The first two events were run on the 2.4-mile short course and were both won by Bobby Unser. The race moved to the 3.4-mile long course in 1981 when another Indy car legend, Rick Mears, drove to victory. The Verizon IndyCar Series returned to the historic circuit in 2005, with Scott Dixon winning three straight years before Ryan Hunter-Reay won in 2008 for Rahal Letterman Racing, Justin Wilson secured the first-ever Indy car win for Dale Coyne Racing in 2009 and Will Power took the checkered flag for Team Penske in 2010.